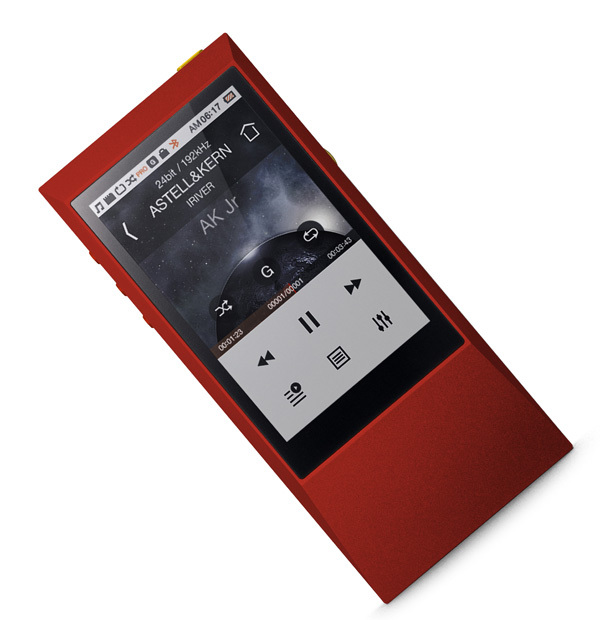 UPDATE: The sleek little Astell & Kern AK Jr. digital audio player is now available as a limited edition in red. 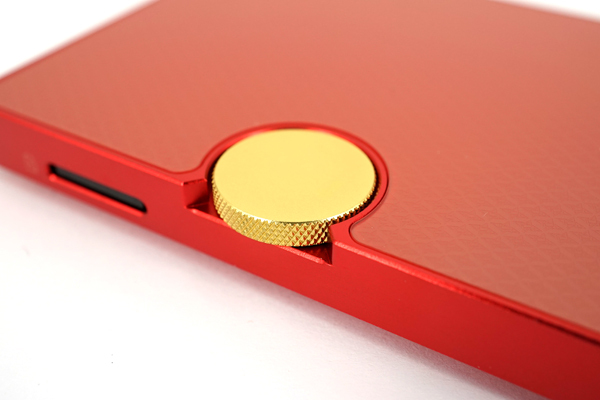 Selling for the same price as the standard aluminium finish version – £399 – the limited edition comes in bright red with gold accents, and will be available exclusively through Amazon UK while stocks last. 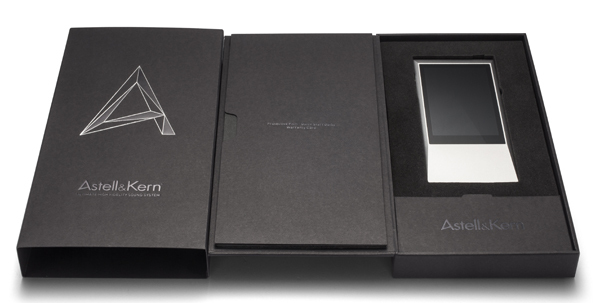 It certainly makes the entry-level Astell & Kern even more striking – and just in time for Christmas! 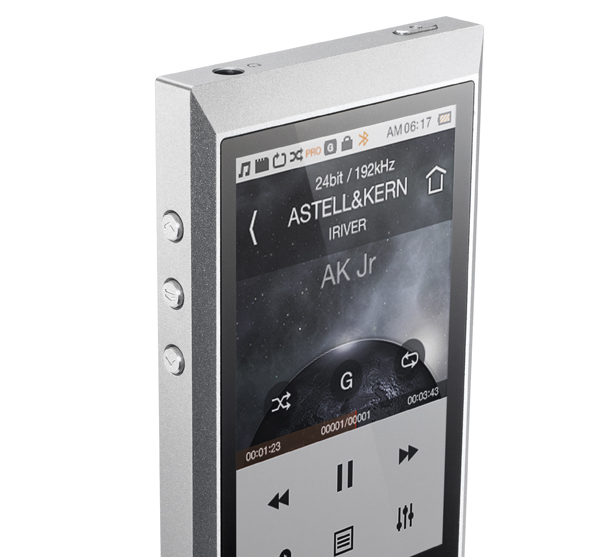 Posted 17.06.15: It says almost all you need to know that, while I was ogling Astell & Kern’s full AK500 system of player, power supply and amplifier at the Munich High End show, my wife – the estimable Hi-Fi Widow – was rather more taken with the brand-new AK Jr pocket digital music player, the latest addition to the company’s line-up. 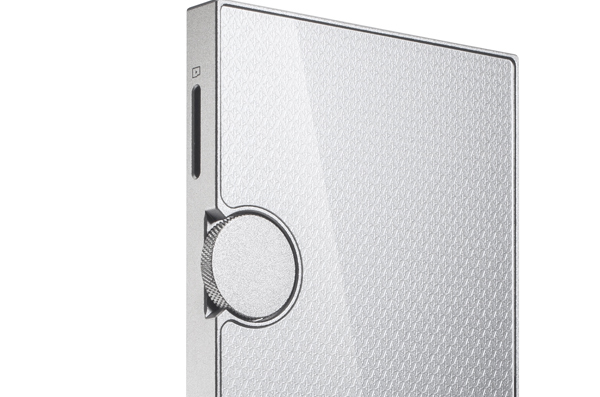 It’s not just that ‘junior’ is compact, with its aluminium casework less than 1cm thick and tapering down to just 6.9mm, and affordable – at least in A&K terms – £399; what really grabs the attention is that, although this is the lowest-priced model in a range going all the way up to the wrong side of £2000, it’s both beautifully finished and feels coolly wonderful in the hand. And having now had one in my hands for some days now – the first, I’m told, to escape the captivity of UK distributor Computers Unlimited – I can also report that the baby A&K is both a delight to use and sounds really rather amazing. It arrives in a slimline package complete with USB cable and a couple of protective films to use over the display, and anyone who’s ever used any kind of digital music player will find little unfamiliar here: the Jr connects to a computer via that micro-USB lead supplied (with a particularly solid fit into the player’s socket), and comes as standard with 64GB of internal memory, expandable to double that with the use of a microSD card. Operation is made simple by a large, clear 3.1in display with crisp graphics – I especially like the sliding cursor bar design to adjust screen brightness and the like – while the main physical controls are limited to power on/off on the top edge, track-skip and pause on the left, and a machined volume wheel set into the rear panel and just protruding to the right, like a vestigial version of the rather more prominent controls found further up the range. As well as the cable connectivity, which can also be used to charge the player or use it with a computer as a portable USB DAC, the Jr also supports Bluetooth 4.0 for wireless connection to suitable speakers and the like. What’s more, a healthy output of just under 2V RMS when at its line-out setting, which fixes the volume from the headphone socket at its maximum, means it can be used straight into an amplifier or active speakers using a suitable 3.5mm stereo to RCA phonos cable. Using a Wolfson WM8740 DAC, it will play just about any format you can throw at it, all the way up to 24-bit/192kHz, as well as DSD64 (using DSD to PCM conversion), so I’ve been trying it with a wide range of my usual ‘torture tracks’ and a lot of favourite music, from hard-hitting rock and electronica through to jazz and even an extended Wagnerfest the other morning, and I have to say I’ve come away very impressed. That hefty output power – at least by portable standards – means this little player has no problem driving even demanding headphones, so those of us accustomed to carting around a pocket headphone amplifier can probably lighten the load a bit by leaving it at home, while the sound quality on offer will probably render that go-everywhere DAC/amp just as redundant. What’s more – and this is going to rile those who’ll have you believe that the iPhone into a pair of good headphones sounds so good you don’t need to bother with hi-fi any more – the AK Jr leaves Cupertino’s finest for dead when it comes to bass weight and conviction, midrange fluidity and openness, and treble sparkle and ambience. Simple version? It just so sounds so much more real than your phone is ever going to – and that includes the particularly impressive Sony Xperia phones I’ve tried, which themselves put the iThings in the shade as a means of driving favourite in-ears or ear-muffs. Battery life, even when used hard, is impressive: a 4hr charge gave me enough juice for a whole day’s listening at highish levels driving the kind of headphones you’d only use with a device like this if you’re either a) a head-fi fanatic or b) a fashion victim, and there was still power left showing on the display when I plugged it in ready for the next day’s use. So unless you’re going to headbang all the way, the A&K Jr should be a pretty effective travelling companion, even for long-haul. This is a remarkably well-sorted little player, requiring no allowances to be made for its compact size and (again, by A&K standards) affordable price. It looks and feels the business, being both stylish and seemingly built to last, is slim enough to fit in any pocket, and yet will drive big cans – or very high-quality in-ears – to a remarkable standard. 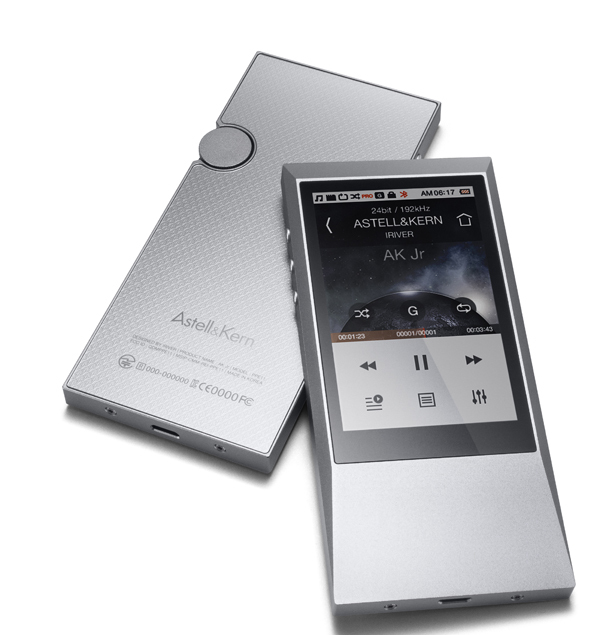 Junior by name, but very grown-up by nature, the precocious child of the Astell & Kern family is perhaps its most impressive offering to date. And now, I think, someone else is nagging to spend some time listening to it! 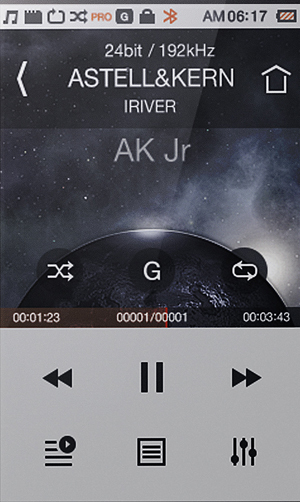 Hi Andrew, a few questions … How does the A&K Jr handle gapless playback? Can you fast forward while playing a track? And what about the presentation of metadata for classical music; does it support catgorisation by work/composition, or must one enter the name of the work/composition in the Album Title tag? Handles gapless fine, yes you can ff/rwd in-track, but no, no composer sort only album/artist/’song’/genre. How does it sound as a usb dac? As good as it sounds playing music stored internally. Thanks for the early review, Andrew, as I’m really interested in this new player. When travelling, I’ve been pleasantly surprised using my iPad with the relatively recently acquired B & W P7s (stunning Headphones in my view). However, iPad storage space is limited, and I suspect I can do much better in terms of storage and audio quality, especially as I have quite a few 24/96 albums. I have recently been looking at the Sony NW-ZX2 Walkman, and Amazon have got it down to £859.00 at the moment, whereas the AKJr is in a rather more sympathetic zone. But that is one hell of a load of insane dosh, and I’m hugely reluctant. It’s also virtually impossible out of the metropolis to find anywhere to audition all this kit. As a classical music fan, audio quality is an extremely important factor to me (at home – B & W 802s, DCS + clock, Vitus amp). Would the AKJr perform well and without amp support with the P7s? Would it support my 24/96 albums? How much of an improvement would it be on the iPad? Would there be a significant performance gap between the Sony and AKJr? Would the price differential signify an unacceptable compromise? 2) Yes – and your 24/192s and DSD64s! 4) Haven’t used the Sony in comparison, so can’t really say, but at least one much more expensive PDP I tried it against was run very close by the A&K. Many thanks, Andrew. That’s most helpful. Looks like the AK Jr could well be a runner for me. Really enjoyed your review and wonder which in ear monitors you’d recommend in the $100 range. Any thoughts would be appreciated. Not too sure about the $ price, Glen, but recently I’ve been having very good results with the new Focal Sphear earphones, which sell for around £100 here and work very well with the AK Jr. Thanks for the review. I’m considering buying either this or the Fiio X5, and the advantage this appears to have is the better operating system. But the one thing holding me back is whether it would be able to drive my beyerdynamic DT990 Pros (250 ohm). Currently I use them to listen to an iPod classic into a Fiio E07K – without the Fiio, they are very quiet and uninspiring. Would I still need the Fiio with the AK Jr, or would the player on its own be enough? Interesting that they used the WM8740 which seems quite the favourite for quite a few manufacturers. It’s been out for a good decade now I think? AVI used it in their Lab Series CD player, Cambridge in their 752BD both of which i have. Both are incredibly good machines and now A&K. I wonder what it is about that DAC in particular? I guess it’s just chosen because it sounds good! I have the AK100 MK1 and while I think its a cracking machine, the one downside is its shuffle ability or rather lack of. Even on full shuffle, it seems to settle on 2 or 3 different sequence of songs and wont deviate from these. So my obvious question is does this unit shuffle properly or is it plagued by the same issue? Interesting. I have read similarly superlative gushing about the Oppo HA-2 yet during an extensive audition (around 40 minutes) using my iPhone 5 and iPod Classic as sources and comparisons, I was not able to detect any appreciable improvement with the Oppo over the iPhone alone. I was fairly disappointed by this as I had intended to buy the little Oppo but it was simply not good enough. Indeed, ANY significant improvement would have been welcome but there was none.